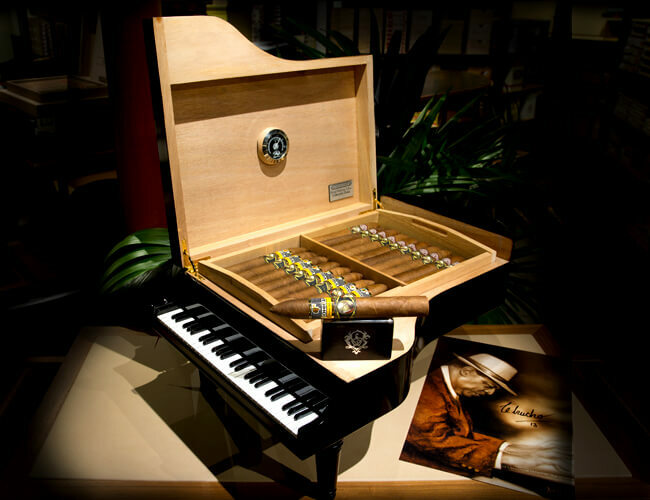 A piano-shaped humidor for its 70th anniversary! This humidor is a true collector's item limited to only 70 pieces in the world. It was entirely hand-made by the Manufacturer "De Cuba" to celebrate the 70th anniversary of Cuban pianist Chucho Valdès. Designed entirely in cedar, it is equipped with a humidifier and an electronic hydrometer. The tail of the piano contains 20 Montecristo No. 2 (Pirámides) and 18 Cohiba Piramides Extra Vintage 2012. Chucho Valdés is a Cuban jazz pianist born on October 9, 1941 in Quivicán, a province of Havana. He is the son of Bebo Valdes, also a pianist and Cuban composer. His work mixes jazz, Cuban music and classical music. Like his father, he is associated with the style of Afro-Cuban jazz and was called the "Cuban Mozart". In 1973, he founded the group Irakere, the first Cuban group to win a Grammy Award in 1980. To date, he has published 31 albums, including 5 Grammy Awards and 14 nominations. He has also received several honors including an Honorary Doctorate from the University of Victoria in Canada and another from the Higher Institute of Arts in Havana.